FileMaker 12 offers many intriguing new features, including new windowing capabilities, significant charting and container field improvements, and a brand new design surface. But to my way of thinking, all of these pale in comparison to the exciting possibilities offered by the new ExecuteSQL function. What’s so great about ExecuteSQL? In a nutshell, it allows us to natively (without a plug-in) perform queries against FileMaker tables using SQL (structured query language). This means that we can now write code to answer questions that previously required adding new table occurrences and special-purpose fields to serve as relational predicates. And of course you’ll want to grab a copy of the FileMaker 12 ODBC/JDBC Guide, which offers tantalizing glimpses of what FileMaker is capable of SQL-wise under the hood. 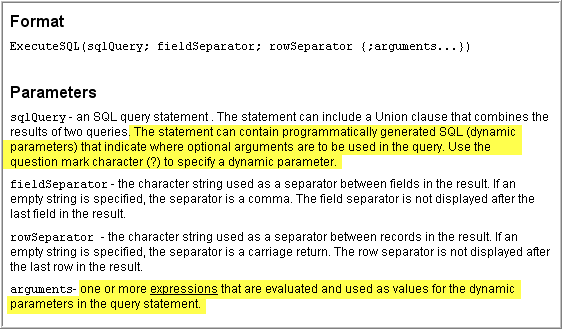 Much of the information in Chapter 7 is directly relevant to the ExecuteSQL function. 2) Although the function is named ExecuteSQL, in FM 12 a more accurate name for it might be ExecuteSQLSelect, because currently it only supports “SELECT” statements. If you need more SQL power you can achieve it with a SQL plug-in such as Dracoventions SQL Runner, or MyFMButler doSQL, both of which are FM 12 compatible. SQL can appear daunting when you first encounter it, but with trial and error you get the hang of it, and pretty soon don’t want to live without it. For a FileMaker developer, one of the amazing things about SQL is that it can perform complex relational operations that are completely independent from the Relationships Graph. SQL doesn’t care about the Relationships Graph at all, except that when you point it at a “table”, you must specify a table occurrence name, not a table name. The main thing to keep in mind — and I’m certainly conscious of it as I write these words — is that it’s okay to take tentative baby steps with ExecuteSQL. That’s why we’re going to keep things very simple today. Really, it doesn’t get much simpler than this, so this is a fitting example for our first demo, ExecuteSQL demo 1. The first parameter is the SELECT statement, the second and third are the characters you wish to use as column and row separators, and we’ll get to the fourth one — which is optional — in example 2, below. Although the second and third parameters are mandatory, you can specify "" (a pair of double quotes) to accept the default separators, which are a comma between fields, and a hard return between rows. …and you can see two versions of this in our second demo, ExecuteSQL demo 2. The first field, c_count_basic, is just a variation on the approach used in the first demo, but what’s going on in c_count_dynamic? Well, if you’ve read the online Help page for ExecuteSQL (and who hasn’t? ), these highlighted portions may have caught your eye. Did you notice that the “arguments” parameter is plural? You can embed as many “?” characters as you wish within your SQL statement, as long as you provide a corresponding number of “arguments” to tie them to. And this, also from the online help, is why you might care to go to the trouble. 1. Unfortunately, there’s a minor discrepancy in the code as written on the Help page… the name of the table (and corresponding occurrence) is “Salaries”, but the code below refers to “Salary” (singular). This has been corrected in the demo file. Well, that wraps it up for today. In upcoming postings we’ll have some more fun with ExecuteSQL. I don’t know about you, but I can hardly wait. This entry was posted in ExecuteSQL, Level: Intermediate, SQL, Version: FM 12 or later and tagged ExecuteSQL, FQL, Internal SQL on April 16, 2012 by Kevin Frank. Excellent. Just what I needed to get going. Then we can all add examples as we go along. Well, thanx for taking time to educating us. Tho’ still an SQL novice, I’m really excited with this new functionality. The ExecuteSQL() function is faster than the previous plugins. I started playing around with SQL last year and used an SQL_Sandbox table (entirely inspired by your’s) to track my queries and how long it took for each to run. I added this to a solution with quite a lot of data. Running one of the more complex queries – locally – would take 1 min on the first run and 54 secs on the second run (returning 72k records, sorted, v11 and SQL Runner). Using FM v12, the same query takes 28 secs on the first run and 11 secs on the second run. Across a network, v11 would take 2 mins on the first run and 54 secs on the second. (no typos). I don’t have a v12 server yet so I can’t add that comparison. There’s one thing that I’ve added to my SQL Sandbox which might be helpful for others… conditional formatting and some extra scripting to ‘step in’ for when it happens to be a slow calc – the results field is bold, solid orange plus I’ve added a ‘Script Running’ note. I did this because I was tripping over my own impatience when ‘nothing seemed to be happening’. This interface device helps prevent me from engaging in ‘dumb user shennanigans’. Thanks Geoff. I’ve been preaching a mantra of “field types for join predicates must match”, but as you point out, you can use Cast to correct a mismatch. I am so glad that FM now allows the use of SQL. But I am totally lost as far as figuring out where in the application one goes to write the SQL! You have explained that ExecuteSQL is different from Execute SQL, which one invokes under scripts. 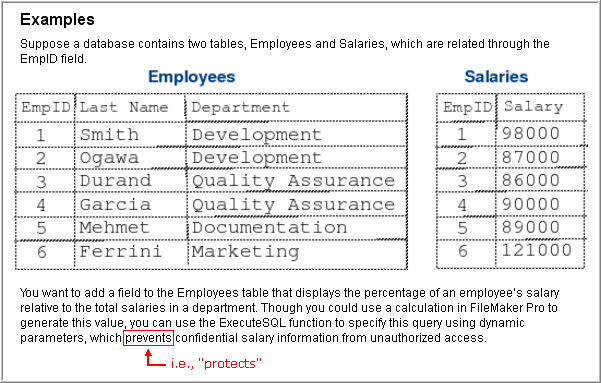 Can you explain where/how one undertakes to write the SQL for queries against local FM tables? Any help would be greatly appreciated since I have spent the last 3 hours trying to find this out. There isn’t a SQL expression builder per se in FileMaker. Instead you can use the Specify Calculation dialog which can be accessed from many places, including the Set Field and Set Variable script steps, “Edit Expression” in the Data Viewer, to define either a calculated field, or an auto-enter calculation expression for a non-calculated field… etc. That’s assuming you want to hand-code your SQL statements. If you’re looking for a utility to help you create SQL statements, you could try SeedCode’s SQL Explorer or Eden Morris’s. SQL Builder. Thanks so much for the info and recommendations! I did download SQL Explorer, but the tutorial I watch started from a page within FM which I didn’t know how to find and it didn’t seem to explain that one invoked the Execute SQL function as a calculation. So now I know that at least. I’m just not sure which access point to use. I experimented with following the directions in my FM Missing Manual book, but that just showed me how to create a calculation for a single field. I’m just looking for an “old fashioned” blank white screen where I can start typing things such as “select a.field1, b.field2 from tableX=a and tableXX=b where….” It’s been a long time since I wrote SQL since I’ve been using Access. But you get the idea. I so appreciate your help!!! We newbies need all the help we can get! Be sure to download the PDF, as it has more information than in the article! Aaaaahhhhhhh! This might explain a lot! I don’t have FM advanced. I’m off to download an “SQL Sandbox” demo. Thanks so much!!!! Thanks so much for your feedback! My problem is trying to figure out how to build table/database level queries instead of queries that affect only one field. Seldom do I need to create calculated fields. But I do need to write queries that full data from multiple fields within a table or from multiple tables. And I typically only want results and not a report showing every record that matches my criteria. I’ve inferred from a number of sources I’ve researched that the advanced version of FM has a data view screen which allows the user to build SQL queries totally independently of individual fields. Do you know if that is true? Yes, it’s true. The Data Viewer in FileMaker Advanced is an essential tool as far as I’m concerned. This was exactly what i was looking for. A way to get text and show that on a layout without needing to create a relationship every time. Thank You ! Hi Kevin – I’m just starting to dive in with ExecuteSQL. I’ve got it working with some simple queries to fetch a found set of records. I was trying to use it to return a list of records from 2 tables (MessagesIn and MessagesOut) and then sort the combined result by a timestamp so I can view a list of all messages in and out in date order. Is it possible to use ExcecuteSQL to search on more than 1 table and sort the combined results by a timestamp field? I’m struggling to get this working and not sure if it’s possible.